Eggplant is one of those vegetables that is mysterious to some of us who have never cooked it ourselves. The good news is that it is very easy to cook and enjoy. Baby should be able to handle and like its soft consistency. The preparation is the same for baby's eggplant as for adults so go ahead and make yourself an easy side dish and feed some to baby! 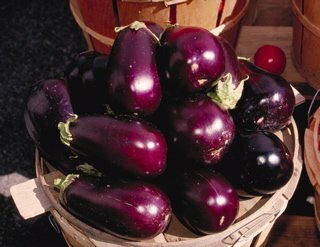 There are multiple shapes and colors of eggplant. If you are lucky, buy the small lavender eggplant, because they tend to be less bitter than the deep purple ones. Look for really small eggplants because they can be less bitter. They should be firm and contain no spots or blemishes. The easiest and fastest way to cook it is to broil or grill it. Go ahead and use extra virgin olive oil for baby's recipe. He/she is old enough to be introduced to olives. Heat broiler and place rack 4-6 inches away. Slice eggplant in 1/2 inch slices. Place eggplant on rimmed baking sheet and brush with oil. Turn over eggplant and brush with more oil and broil until browned on both sides, and tender. Eggplants should be kept in the bottom of the refrigerator, and used as soon as possible. The inside will become more bitter the longer you keep it. No, the skin is tough so pesticide contamination is probably not a problem. Broil as above and then add chopped parsley as a garnish. If your family has a history of nut allergies, you probably should wait until your baby is 12 months old before introducing nuts. Don't be limited to buying just peanut butter, the American staple. It has become easy to find almond butter, walnut butter, and cashew butter which are also very tasty. It is important to buy peanut butter without any added sugar or oils. Peanut butter doesn't need anything added to it to taste delicious. Peanut butter can be a choking risk if it is too thick for baby to swallow. 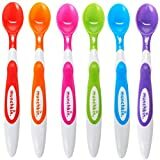 Thin the texture for baby in agreement with baby's eating skills. 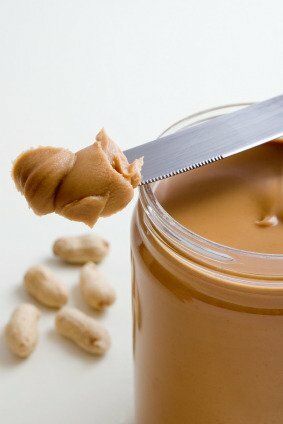 Buy smooth peanut butter that has one ingredient in it - peanuts. This may be difficult to find so if there is added salt - go ahead and buy it. Skippy and Jif have added sugar. Look for organic or natural peanut butter. It might have oil separation but that is easy to mend (just mix it). Peanut butter is a great way to add a little protein to those ubiquitous crackers you are feeding your baby. It can be difficult for baby to eat thick peanut butter, so mix a little water in it before you spread on bread or crackers to make it more palatable. Store peanut butter in the refrigerator. Yes, if you can find it. Add some roasted to chicken to to make a meal of it. This recipe is adapted from Mark Bittman's "How to Cook Everything". Cook spaghetti via package directions. Toss with sesame oil after draining. Mix peanut butter, sugar, soy sauce, and vinegar. Adjust seasonings with salt and pepper and thin sauce to the consistency of heavy cream. Toss the noodles and the sauce, garnish and serve.